I don’t have any tattoos, but I’m thinking that DRD4-7R would be a good one. It’s the name of the gene supposedly responsible for my restless, never-satiated nature; the one that makes me constantly seek out new experiences and new terrain. 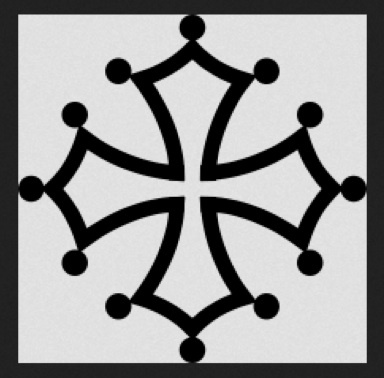 The letters could possibly fit inside the other tattoo that I’ve long contemplated, the croix de Toulouse (where I lived for a year), aka the cross of the Cathars. In addition to this cross symbolizing the region where I spent a formative year of my life, the Cathars were a group of persecuted heretics, and although I don’t espouse their beliefs, this probably says something about why I identify with them. The other day I challenged a friend: “I feel like you’ve constructed this quasi-hermetic life in which you inhabit maybe 5 square miles surrounding your house and that’s it… Why is that? When did you become that way?”, I pressed, with genuine curiosity but, if I’m being honest, a note of judginess in my tone. This question was posed to a person who used to travel in his youth, and even lived abroad for a couple years, but who currently takes pains not to leave the cloister of his neighborhood. Why, indeed. I thought about this for a moment. And although I think he was just diverting focus from scrutiny and didn’t care too much about my answer (I say this because I gave a flip response and the subject was changed), it got me thinking… what makes some people crave a constant change of scenery? Why am I itchy unless I have plane tickets in the bank or a road trip on the horizon? I’ve always had “restless legs syndrome”, but after I got married I accepted the idea that sacrifices would have to be made. We were homeowners now, and not getting any younger; we should put money in savings for the house or retirement rather than take frivolous vacations. Besides, any time I’d suggest a trip, even just a short weekend road trip up north or something, M would claim he had to work, and we wouldn’t go. Towards the end of the relationship I just started going off on my own with friends since he was unwilling. One of the first things I did after our separation was book a trip to Portugal. Buying those tickets made me giddy, and reconnected me with the person I was eight years prior. Since then, I’ve been to LA and New Orleans, and will soon be planning a trip somewhere in Central America thanks to a free ticket given as compensation for a canceled flight. Not to mention that I have enough Delta miles for a round trip to Europe. I’ve been window shopping for cheap plane tickets the way some women window shop for Louboutins. But back to my friend’s point: Why? Well, right now I think it’s pretty obvious that travel offers an escape from certain realities of my life: that I’m going through a divorce; that I live in a cramped little apartment; that I’m single and will likely never have a family so I might as well do things people with kids can’t do, like pick up at a moment’s notice when I find a great deal. (This isn’t a pity party, by the way; just me adjusting to my new normal.) But the other day, I came across an interesting article that talked about a genetic component to all of this; a “wanderlust gene”. Needless to say, I was intrigued. According to David Dobbs of National Geographic, the mutant form of the DRD4 gene, 7r, results in people who are “more likely to take risks; explore new places, ideas, foods, relationships, drugs, or sexual opportunities.” [Ahem.] He went on to say that bearers of this gene “generally embrace movement, change, and adventure” (paraphrased from Dan Scotti in this Elite Daily article; here’s the original NatGeo article). Another blog article tells us the gene is “carried by an approximately 20% of the human population and is linked with restlessness and curiosity along with being a named association with ADHD (Schilling, Walsh & Yun, 2011). This restlessness can cause people to take bigger risks which includes exploring new or different places.” The ADHD connection was not shocking to me at all, as someone who has long suspected myself of being on the spectrum. Of course not all travel can be explained by genetics- there are people who travel for status, to check things off a list, or who go someplace like Cancun and never set foot off the grounds of their all-inclusive resort- but my Capricorn nature loves scientific, reasoned explanations to things, so I appreciated stumbling on this info. Now, to consult the I Ching to see where I should venture next… suggestions welcome!